I have to say I am glad holidays and all the madness they bring are behind me and can return to everyday routine (little less crazy)! I don’t wish to start my first post in this year with the retrospective on what I have accomplished (or failed) last year but wish to focus on year that is ahead of me and all of you who follow this blog and push me each week to work harder in order to come with something new and tempting for all to try. All I can say, last year was fun and hope this one will be even more. This year I am starting with online classes on how to create a crochet doll or toy and write the pattern. First one I will make with my Facebook group friends and ladies that are interested and waiting patiently for the past two months (for the holiday season to be done). This first class will start in week or two. I will try to keep you updated on the progress what is done. At the end of the class or maybe better say course, will show you the patterns and dolls girls came up with. In the last two years I have received many mails asking me what brand of yarn I use for my toys and dolls. This year with each pattern I will offer you the yarn I worked with, for sale, through Etsy store. This way anyone who is interested in working with exact type of yarn will be able to find it and buy it online. Regarding my patterns and posts on the blog, will continue to share my work in as many details and photos as possible. With each pattern will try to show you something new you can learn and use in your future work. I am sure it will be fun! Let us return to the topic of this post and Koalas! This year is starting with competition. I am not very competitive person but I decided to participate. I just wish I had more time to make panda family as well (this is one of the patterns I wish to make this year). Amigurumipatterns.net has organized competition where everyone was invited to participate. Theme was animal parents and children. For that competition I made my favorite, koala bears. Mama and shy little baby koala. These are made with heart to all my Aussie friends! Specially dear blogger friend Sharon and her Gentlstitches blog. Koalas have been accepted, voting has started and now it is all in your hands! Here are few photos of my little family. So many beautiful designs are there. Hope you will enjoy and find your favorite. Best of luck to all designers and their fabulous designs. To all of you who will go and check the page, thank you for taking your time. 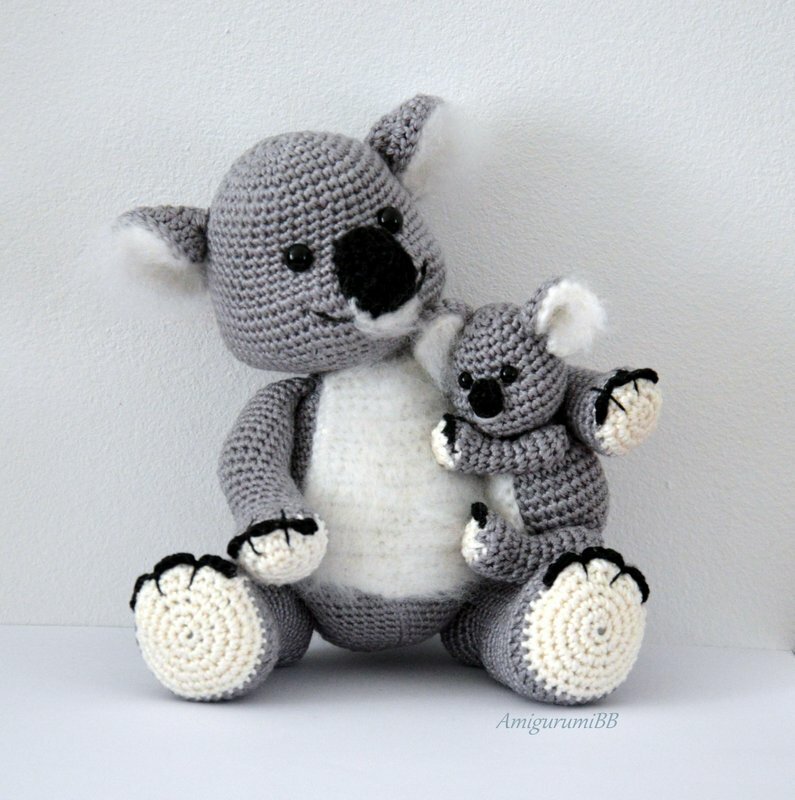 The pattern of these koalas is coming soon! Awww! They are so cute! I just love them!